Bruce Lundin was an American aerospace propulsion engineer. Lundin earned a B.S. in mechanical engineering from the University of California in 1942 and joined the Lewis Laboratory (now known as the Glenn Research Center) in 1943. There he investigated heat transfer and methods to improve the performance of World War II aircraft engines. In 1946 he became chief of the jet propulsion research section which conducted some of America's early research on turbojet engines. He became assistant director of Lewis in 1958 and directed much of the center's efforts in space propulsion and power generation. 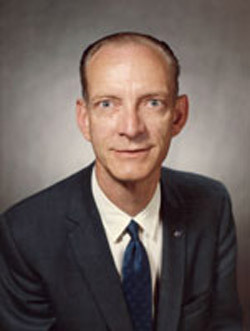 Lundin then advanced through the positions of associate director for development (1961) at Lewis, managing the development and operation of the Centaur and Agena launch vehicles, and of deputy associate administrator for advanced research and technology at NASA Headquarters (1968), before becoming acting associate administrator for advanced research and technology there (1969). Later that year, he was appointed director of the Lewis Research Center, a position he held until his retirement in 1977. For celestial latitude see celestial sphere.